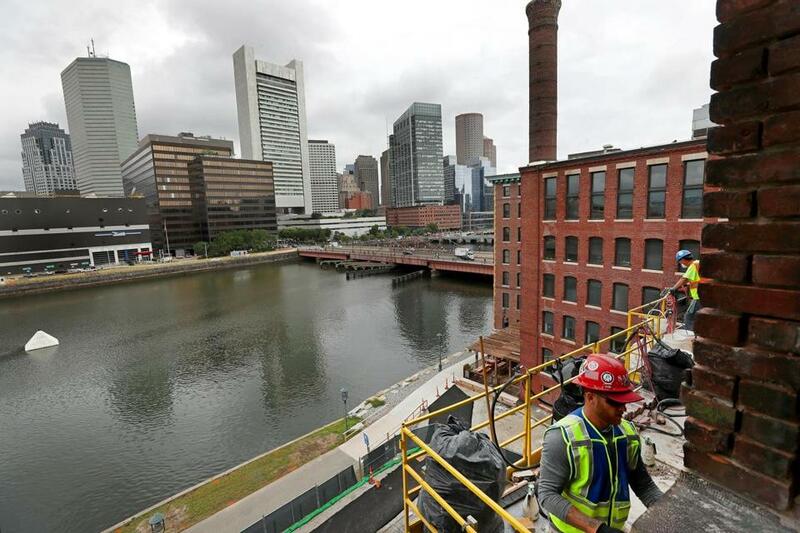 Work was underway in August on General Electric’s Fort Point offices. General Electric said Thursday that it plans to sell its future Fort Point headquarters property and reimburse the state for $87 million in incentives the company received to move here, signaling a major step backwards from the ambitious plans it unveiled in 2016. The board of MassDevelopment — a quasi-public agency that owns part of the property — approved a plan Thursday to jointly market the 2.7-acre site with GE. The sale proceeds will reimburse the agency for the $87.4 million in state money that has been used to acquire and prepare the Fort Point parcel. GE, however, is not leaving Boston. The struggling company said it will still move in August into two brick buildings on the same site at Necco Court after renovations are completed, but won’t come close to creating the 800 jobs it originally promised in return for receiving generous incentives. GE also confirmed what has been widely assumed for a while: It has no plans to proceed with construction of the striking 12-story tower next door that it originally envisioned. The company owns the portion of the property where its nearly 300,000-square-foot tower would have gone, while MassDevelopment owns the two existing buildings. 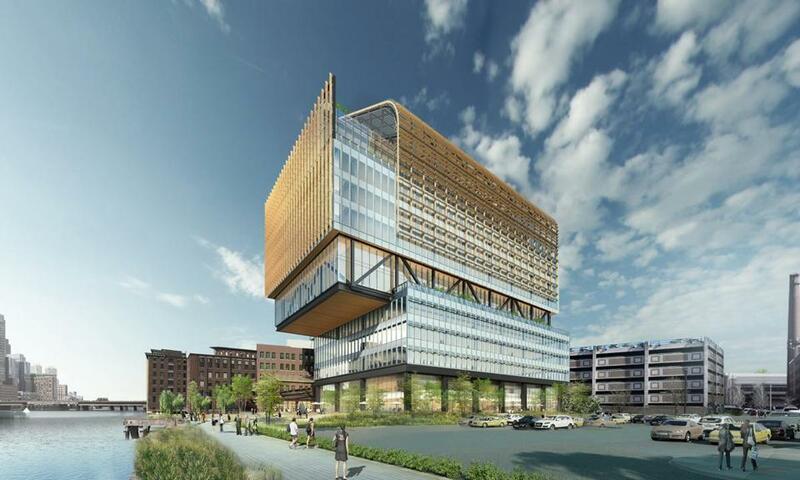 A rendering of the headquarters General Electric planned to build along Fort Point Channel. GE said it will work with Boston officials to scrap a separate property tax incentive that could have been worth as much as $25 million. A significant portion of that package depended on the number of new hires, but the company could have still reaped some tax benefits without building the tower or hitting the hiring targets. City officials said GE’s presence has generated an additional $2 million in tax revenue over the past two years — without any tax incentives being awarded. The property sale is a natural extension of the aggressive belt-tightening that new chief executive Larry Culp has led since taking charge in October. The company was a much bigger operation when it moved to the neighborhood with much fanfare from Fairfield, Conn., in 2016. But it has been besieged by a plunging stock price, problems in its power-turbine business, and accounting issues. As a result, GE has aggressively been divesting various business lines, big and small, to streamline its business and shore up its profitability. Instead of a grander headquarters with at least 800 workers, GE now expects to employ about 250 people in the 95,000-square-foot Necco complex. That’s slightly more than the number of people who already work at GE’s nearby rented corporate offices. For Culp, the downsizing mirrors the playbook he followed when he ran Danaher Corp., the Washington, D.C.-based conglomerate that has a nondescript headquarters. “It’s keeping with that vision of a much leaner corporate body,” said Joshua Aguilar, a Morningstar analyst who tracks GE. The original incentive agreement with the Baker administration was worth as much as $120 million in state funds, but GE stopped submitting for reimbursements a few months ago as it began to work out the deal that was unveiled Thursday. GE, the Baker administration, and MassDevelopment negotiated a plan to put the property on the market. The agreement requires that the state be made whole before a property transfer takes place, state officials said, although GE expects the sale price will easily exceed what is owed to the state. State officials and GE decided they could get a better return by selling the two Necco buildings, along with the open land. To pull that off, GE would need to reimburse the state for its expenses. GE officials say they’re also trying to maintain their strong relationships with the Baker and Walsh administrations, and with the community. After they’re sold, the buildings would then be leased back to GE for its headquarters, guaranteeing revenue for the future owner. Meanwhile, the new owner would receive the permits for the 12-story building. The land and existing buildings were previously a part of Gillette’s massive South Boston campus, until the property was sold in late 2016 for GE’s headquarters. Since that time, Gillette parent Procter & Gamble has sold a few other pieces of land along the campus perimeter, responding to the neighborhood’s heated market. Most notably, developer Related Beal is poised to acquire 6.5 acres next door, and would likely give the GE property a look. “In many ways, GE has unlocked a part of our city that was sitting dormant, even during the real estate boom,” Barros said. GE executives said they still plan to complete the open space work and renovations to a pedestrian bridge that the company promised. GE also said it will not waver from a commitment to give $50 million, over time, to local charitable organizations. City Councilor Michelle Wu said the changes in GE’s corporate strategy underscore the need for new rules governing business tax breaks, such as those she proposed to the City Council this week. Wu wants the process to be more transparent, and to incorporate more stringent standards. “We should be expecting more out of the packages or deals that are struck,” she said. Peter Cohan, a lecturer at Babson College, said GE’s star had already been falling when state and city officials inked their incentives with former chief executive Jeff Immelt three years ago. Shirley Leung: Three CEOs later, is Boston a curse for GE?